We have developed and tested a new concept in LED accent lighting and have a new slim module design that makes the darkness really light up! Our new 2 piece LED Accent Module kit is a simple and inexpensive way to put lighting anywhere you like, even under your vehicle! These are super tough, water proof, shatter resistant, and built on an aluminium backing to hang on to almost anything you can throw at it. We even pre-drill a mounting hole in the unit for ability to mount in the most harsh environment. In 5 colors to light up the night. Red, Blue, Green, Yellow/Orange, and white. 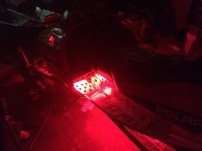 We have people using these under Jeeps and UTVs, under sleds, inside trailers and campers for interior lighting, and anywhere you want extra touch of light! NEW Accent Modules Close up! Here is a picture of the ALL NEW LED Accent modules close up. 2 piece kit makes for super bright light! Here is the full color display box that the NEW LED Accent Modules come packaged in. Full installation instructions and tips on the back side. 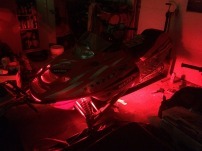 Here is a sled my son just finished. The RED Modules are so bright, the light in the belly pan is actually shining THRU the plastic from the inside! This installation has 4 kits installed. He has a set in the shock towers, a set under the hood, a set in the foot wells, and a set under the running boards in the tunnel. From the rear view you can see how bright the foot well area and under the sled is with these modules. They are crazy bright! !